To start off the 2017 Homegrown Story series, the Gateway is taking a departure from our usual approach of profiling innovative food security programs from across the province and digging into the issue, and solutions, to the widespread food insecurity and poverty plaguing BC. To do so, we spoke with Dr. Valerie Tarasuk, Professor at the University of Toronto and Principal Investigator with the PROOF: Food Insecurity Policy Research program as well as with Trish Garner, Community Organizer with the BC Poverty Reduction Coalition. The fable depicted in the video above, a well-used teaching tool of the BC Poverty Reduction Coalition (BCPRC), offers a metaphor by way of the broken bridge for working upstream and interrogating the root causes of poverty. The food and anti-poverty movements are beginning to intersect in unprecedented ways remarks Trish Garner, Community Organizer with the BCPRC, as recognition grows that charitable and otherwise ad hoc responses to a provincial hunger crisis are insufficient. What do we know about the crisis? For starters, approximately 600,000 individuals in BC are living in poverty and 485,500 British Columbians are experiencing food insecurity. Children are disproportionately affected as approximately 1 in 6 kids under 18 are living in a food insecure household. There’s ample evidence to suggest that public policy interventions that improve the financial circumstances of people at the bottom end will improve their food security. Everything we know says if you want to drop the probability of somebody saying that they are struggling to feed themselves and their families, the way to do that is to improve their financial security. Trish and Valerie both lament that BC is the only province in Canada without a comprehensive poverty reduction plan. 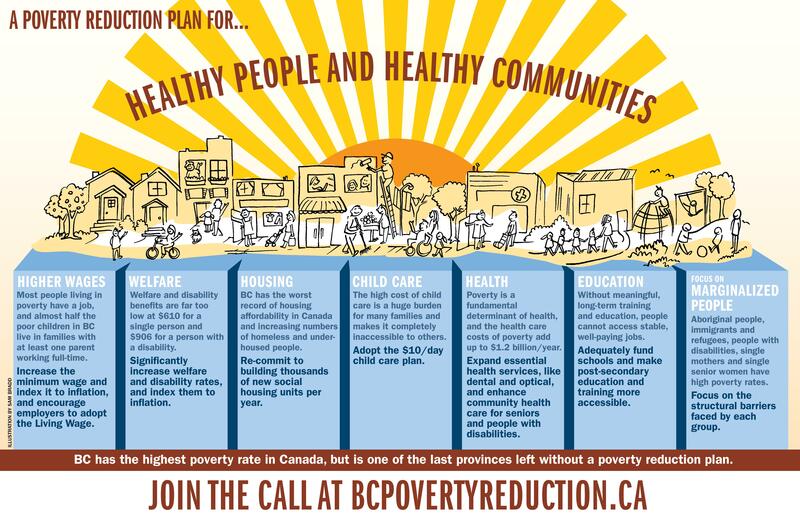 To fill the void, BCPRC developed its own Poverty Reduction Plan for BC. The plan itself has 7 pillars ranging from raising social assistance rates and the minimum wage, introducing living wages, and addressing the barriers and financial burden of other social goods including housing, childcare, education, and health care. The Living Wage for Families campaign has an online calculator to help determine the living wage rate for different parts of the province which also incorporates benefits coverage into the equation, “You can see some regional differences in a living wage when you look at higher food costs in northern communities and one like Cranbrook and Revelstoke that cross mountains.” Contrasting a living wage for Metro Vancouver compared to the minimum wage as an example, BC’s minimum wage sits at $10.85 – one of the lowest in Canada – whereas a living wage is almost double at $20.64. The idea of a basic income guarantee continues to be a lively conversation among BCPRC members. The coalition’s proposed poverty reduction plan notably includes living wages, an employer driven solution, alongside policy change and public investments in income assistance, affordable housing, education, and childcare but makes no mention of a basic income guarantee. For Trish, the benefits of a basic income approach are that it would “avoid stigma and access issues that go along with the current income assistance program.” However, she is concerned that introducing a basic income program for BC could mean cuts to other necessary supports, “I worry about putting our full weight behind it until we know more. When you reduce it all down to income, what else do you lose? We haven’t been able to provide adequate income through the welfare system – rates have been frozen at $610/month for 10 years – so why do we expect to provide an adequate income through basic income?” As one Canadian example to draw inspiration from, Newfoundland and Labrador was able to decrease food insecurity by 50% by increasing welfare rates. With public policy as key, what then is the place of community food security work in affecting individual and household food insecurity and poverty reduction? In two weeks, we’ll publish what Trish, Valerie, and some of you have to say in response to this question as Part II of this series. This entry was posted in Food Insecurity, Food Policy, Poverty. Bookmark the permalink.